This week's show was originally broadcast exactly five years ago, but it will be brand new to many listeners, and even if you heard it then, it's worth hearing again. We're going to take up arms, hear about some guys named Charlie, we'll say hello to Dolly and celebrate a number of birthdays. 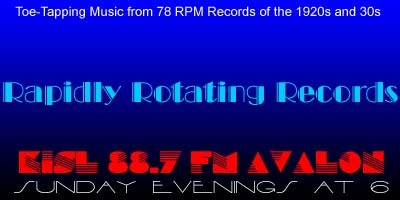 And a number of records on this week's show are making their Rapidly Rotating Records debut. Charlie Two-Step – Roane's Pennsylvanians / Cliff Nazarro, v.
Don't Hang Your Dreams On A Rainbow – Bernie Cummins and His New York Biltmore Hotel Orchestra / Bernie Cummins, v.
Take A Good Look At Mine – Jean Goldkette AHO / Harold Stokes, v.
I Don't Need Atmosphere (To Fall In Love) – George Olsen and His Music / Bob Borger, v.
Smile, Darn Ya, Smile – Ben Selvin's Knickerbockers / Joe Mooney & Dan Mooney, v.
Charleston Dolly – Tom Waltham and His "Ad Libs"
I Still Keep Dreaming Of You – Glen Parks AHO (Jack COleman Orchestra) / Jack Peck, v.
If I Didn't Know Your Husband (And You Didn't Know My Wife) – American Dance Orchestra (Harry Roy) / Harry Roy, v.
Weary – Joe Sanders AHO / Barbara Parks, v.
Put Your Little Arms Around Me – Gus Arnheim and His Coconut Grov Orchestra / Loyce Whiteman & Make Trio, v.